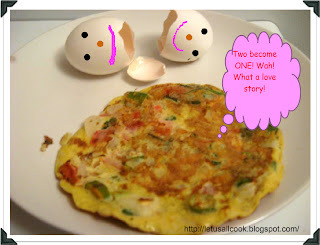 There was a problem viewing my vegetable omelet which was posted previously, so I am re posting it for the 101 Omelet series event. Beat the eggs with yellow in high for 2 min and in low for 1 min. Add the vegetables, green chillies and salt and mix well. In a non stick pan, add oil and take a scoop of this beaten egg and pour it in the center. This will automatically spread into a round or some amoebic shape. Now, add pepper and allow it to cook. 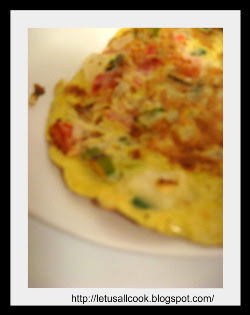 When one side is cooked, turn and cook the other side of the omelet. Ta-da! Vegetable Omelet is ready and Serve hot! LOOKS NICE ND YUM,..THNKS FRO DROPPIN BY...WILL BE LOOKIN FORWARD FOR UR ENTRY...HPPY BLOGGIN..